How many polar bears are there? Where do reindeer and moose go in the winter? Why do wolves choose to make their dens in certain places? What makes the ideal bison calving site? Conservationists in Alaska would love to know the answers to these and many other wildlife-related questions. Unfortunately, the environment is pretty tough out there in the US's largest and northernmost state, making it difficult to keep track of what's going on within its vast wilderness areas. Alaska is more than twice the size of Texas, the next-biggest US state. But while Texas is home to 26 million people, Alaska has a population of only 735,000. "The places we're interested in have few roads, lots of very cold weather and lots of big mammals," says Sophie Gilbert, a conservationist from the University of Alaska Fairbanks (UAF). Aforementioned moose and bison aside, there are also pumas, lynx, wolverines, fishers, sea otters, mountain goats and, of course, all three US bear species – black, brown and polar. Luckily, tracking all of this wildlife recently got a little easier. 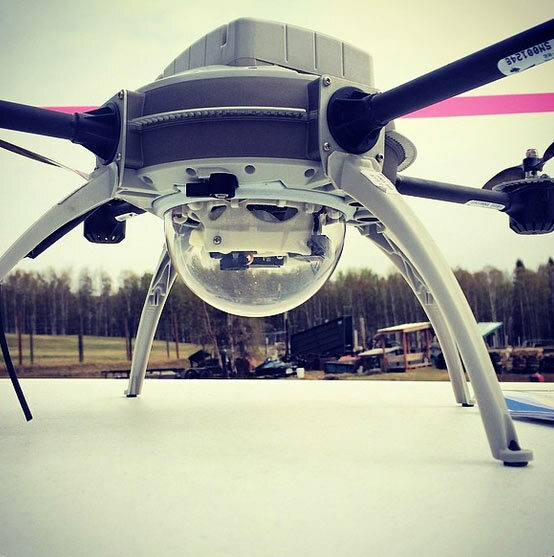 Last week, a team from UAF flew an unmanned aerial vehicle (UAV) over central Alaska, looking for reindeer. Gilbert explains that previously the only way to survey animal movements and behaviour in these parts was in a light aircraft. "It's time consuming, expensive and the noise often scares the animals away," she says. And it can be dangerous too, especially when flying in bad weather or in the area's tight mountainous valleys. "Every biologist knows someone who has died in a plane crash," Gilbert adds. But now, it seems, there is another way to collect valuable data about wildlife. Last month, the US Federal Aviation Authority gave the university a two-year licence to use an Aeryon Scout Unmanned Aerial Vehicle to conduct wildlife surveys. It's a pilot project (no pun intended). US authorities want to find out how well drones can help conservationists locate, identify and count wild animals. 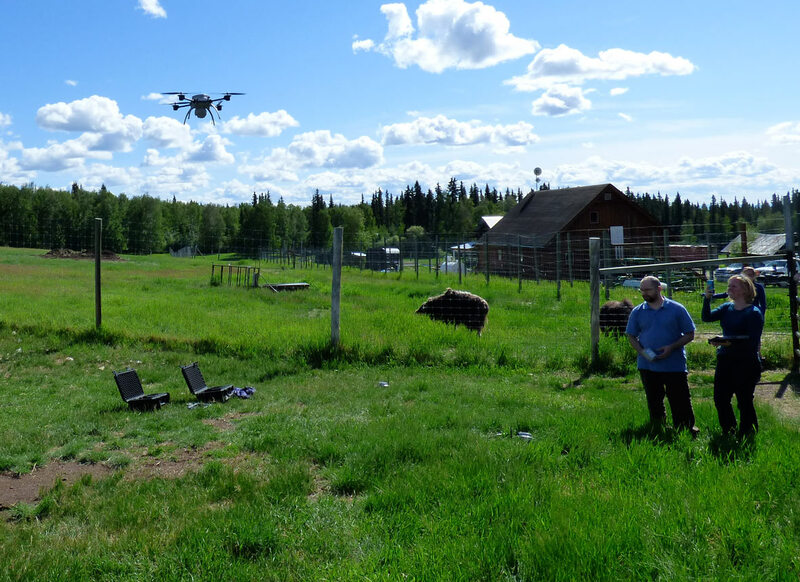 A drone takes its inaugural flight over the university's Large Animal Research Station. Image: Sophie Gilbert. Last week, Gilbert sent the UAV up for its inaugural test flight over the university's own Large Animal Research Station. "First, we have to check how well the technology works," she says, explaining that the research station has 70 captive caribou, musk ox and reindeer, living in a semi-wild environment. "We know that there is a certain number of animals in a certain place, so testing the drone here, we can work out if the technology is noticing all the animals it flies over." Once the drone's recording accuracy is confirmed, and Gilbert learns which information-capturing techniques work best, at which altitudes, she plans to send the drones out into the wild. "We want to discover the ecological drivers of population movements, [the] increases and decreases in animal populations," she says. "We know that we stop seeing certain animals at certain times of year, [and] we want to find out where they go and how they get there. We hope the technology will help us answer these basic biological questions." Gilbert is also thinking about how the drones could help existing wildlife conservation projects. For example, when a problem occurs with an animal that's been tagged with a GPS collar, it can take officials several hours to get to it. "We can send a drone much quicker [and] go to the exact spot to find out what happened," Gilbert says. It's still early days for the project, though, and it will take a while to find the right tech for the right job. Small quadcopters, for example, are better suited to shorter flights. "Where you want to get specific data from a certain area that's not too far away, you need a drone that can be programmed for very precise flight paths," explains Mike Hatfield from the university's engineering department. "For longer flights to more distant locations, larger ScanEagle-type drones give you up to 24 hours' use. [That's] good for offshore use, or for going deep into the wilderness." Gilbert believes drone technology will help her team gather high-quality data more efficiently. "These drones are very quiet. [They] can be flown in lower and slower than any plane or helicopter, much closer to the animals," she explains. And drones equipped with cameras and infrared technology can also detect wildlife that a human looking out of a plane with binoculars might miss. 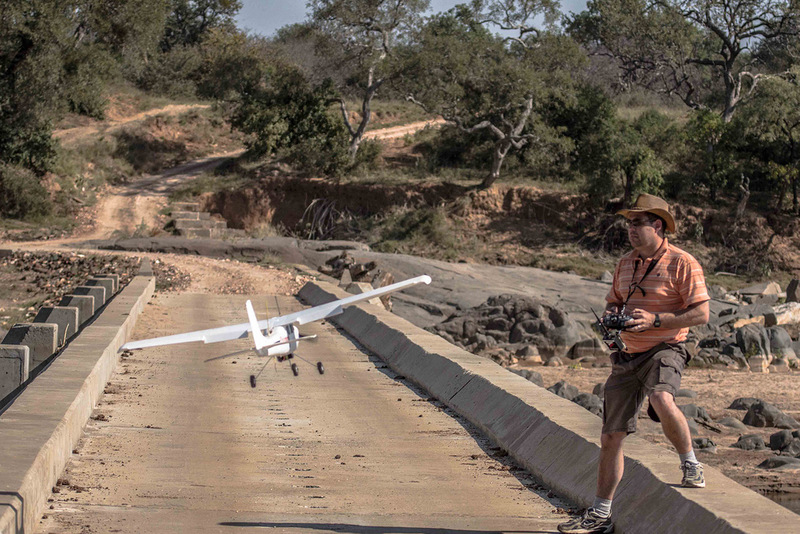 In Nepal and some African countries, this same stealthy, eye-in-the-sky function has made UAVs a valuable weapon in the increasingly desperate fight to protect animals like rhinos from poachers. However, plans to use drones to monitor animals at risk in Kenya and South Africa have since been scuppered by governmental bans on privately owned UAVs. Luckily, the UAF team doesn't have the same problem. The US already has a system of regulations for UAVs and authorities can use them to make decisions about which drones to allow. Officially sanctioned projects, like the Alaskan one, are more likely to be trusted with a UAV licence. South Africa, on the other hand, has banned drones pending the development of its own regulatory framework. In Kenya, the ban was imposed after authorities deemed private drones to be a security threat. Gilbert hopes these bans will be lifted soon, and that they don’t spread to other countries. "There's so much commercial interest in drones, so I can’t see them being banned for long," she says.